Africa House board chair and president Karifa Koroma, right, with Sokhom Tauch, executive director of the Immigration and Refugee Community Organization. Karifa Koroma serves as Chairman of the Board of Africa House, a multilingual community-based center that provides African refugees family-focused access to services. The newest service offering through the Immigrant and Refugee Community Organization (IRCO), Africa House provides job training, health education, referral for social and support services, family intervention and leadership workshops, community engagement, and other services. More than 20,000 Africans from 25 different countries now make Portland their home. The diversity of the African refugee and immigrant community posed some early challenges in pulling together a cohesive community effort. In time, community leaders put their differences aside to work toward a common goal: to build a community service center that serves the diverse needs of African refugees and families. Koroma was successful in ensuring that the advisory board represented diverse leadership from various African communities. "It took us a long time to get here, but the journey was worth it. Now, Africans are able to come together as a strong community — under one roof — speaking with one voice," he said. In his own words, Koroma talks about his personal journey toward becoming an advocate for the growing community of African immigrants to the Portland area. I grew up in northern part of Sierra Leone, close to the border of Guinea, in a predominantly Muslim village. My father didn’t believe in English education, so I had to take care of my own school expenses. There is no forced educational system. If you choose education, you have to pay for your way. The village I came from didn’t have a high school. I had to go to the nearest city to study – about 100 miles away. I started school when I was 11 years old. I hung around people who spoke English, so I was able to learn the language faster than most of my friends. When I was in high school, I was lucky to work with the Peace Corps. They helped pay for my education. In Africa, Peace Corps volunteer travel from village to village, helping with education, agriculture and road work. The Peace Corps group I worked with focused on rice farming and helping native people find more productive ways to grow rice. They brought rice that can grow in two different seasons. They were training people to learn to grow rice twice a year, to be able to harvest more for the population. Even when I was young, I had always been able to get along with people from different cultures. In high school, I had worked with Canadians, British folks who taught at the schools, and finally, Americans. My job was to help Peace Corps volunteers learn the native language and culture. How to talk to people, how not to be afraid to communicate, and how to make friends with locals. Both sides were curious to learn about each other. I also worked on helping bring the community people together and talk to them about the purpose of the Peace Corps in the village. I became good friends with some of the people I worked with. They even helped pay for my way to come to the United States. I started attending Chemeketa Community College, and took classes there for a year. I became familiar with the courses I wanted to take, and gravitated toward law enforcement and social science. I was working at a factory, when I ran into friend of mine from Ethiopia. He asked me if I played soccer. I said yes. He said that Western Oregon State College is giving away scholarships for soccer players, which paid for my way to go to school. In those days, when we leave Africa, the number one goal is to go to school and get an education. We didn’t yet have any problems back home. Everyone who leaves desires to get a college degree, go back, work and help out the country. In the 1990s, that changed when the war broke out. Some of us who were here stayed. We couldn’t go back, because the fighting was pretty intense in some places. Many U.S. educated Africans decided to stay and work in the U.S.
At Western Oregon State College, we had a very large population of foreign students. It didn’t take me long to find out that many of the students were getting bored and depressed. There were no cultural activities on campus. Some students felt so culturally deprived that they choose to leave and go back to their country. We started a Foreign Student Union. Learning how to tap resources helped a lot. I learned that we can get funds for activities on campus. Foreign students pay several times more for tuition than locals, because we pay out-of-state tuition and foreign student fees. We started a foreign student advisory group – made up of students from Asian, Africa, Central America, the Polynesian Islands – to form a Cultural Center. We put together cultural shows featuring cultural foods. Once a year, we put together a big Culture Night, which brought together everyone from the university to come see cultural performances. It became very popular. I helped put together counseling programs for foreign students, so they can get the help they need. I also linked up foreign students with American families so that they will have somebody to associate with. My experience in college made me think a lot about what it means to live in a foreign country. What is it like not to be around people who look like you? Wouldn’t it be nice to have a place where folks from different countries in Africa can access services? When I worked at the Immigrant and Refugee Community Organization (IRCO), the need for such a place became even more real. At the time, we were seeing more Africans from different nations coming to this country. It was necessary to have an African community center, where we can help African refugees and immigrants access services. I was one of the first retention specialists hired by IRCO. My job was to help employers understand how to work best with new immigrants from different countries. I also helped people find and keep jobs, by offering support and guidance. I learned that it’s really important to advocate for your own community. My experience as a student was different from the way many Africans were coming into the country. People who come to this country as refugees are not here by their own choice. They are thrown out of their country for political reasons. They end up in a refugee camp, and they are brought in to the United States. Once here, many people come unprepared, uneducated and have very little knowledge about how to access services in this country. Advocacy groups help newcomers bridge the gap. Simple things like how to ride a bus, how to get a job, how to stay employed. At the time, we also began to see that the crime rate was increasing in some communities. Some are running into immigration problems. In many cases, their involvement in the criminal justice system has to do with not understanding the laws in this country. We had to set up programs about how to be successful in this country, to teach them the do’s and don’ts of American culture. In public schools, children were being left behind because there were no bilingual, bicultural teachers. We started an advocacy group to work with teachers in Portland Public Schools to help African parents help their children do well in school. When we first came, we didn’t understand the culture. Now, we know how the system works. I personally felt that I should take a leadership role to help those people that are coming after us. Look at the history of refugees during World War II, when white Europeans started coming to this country. Americans of European descent assisted them to settle. Asians and Africans didn’t have that kind of help, because there were so few of us. In time, the southeast Asian community began setting up centers to help other Asians that came after the Vietnam War. Africans needed the same kind of help prepare them for their new life in America. That’s why I felt that role was important. Two years into my work, IRCO executive director Sokhom Tauch and I began working together to build an African organization to provide such services. Soon, the African Refugee and Immigrant Network of Oregon (ARINO) was formed. My job was to set up meetings with community leaders from different tribal groups from all around Portland. Friction with the way the organization was set up caused the group to go away. We then formed the African Coalition of Oregon. That group operated for a couple years, then reached some obstacles. We formed the African Community Center of Oregon, which exists to this day. 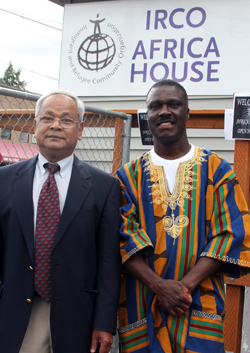 In 2006, ACCO was successful in obtaining a grant to start Africa House, a one-stop community center for African refugees. We have so many different tribes, and all those little tribes have their own nonprofit group based on tribal affiliation. I felt that having Africa House would serve as an umbrella organization for all these groups. I stepped away from the 501c3 situation to form a coalition. That enabled us to go to each of those groups and get one member to be part of the coalition. It was really difficult for me to talk to someone from a different tribe in Africa, and tell them that they need to forget about our differences and try to form one community. That took a lot of work to earn the respect and trust of the community. People tend to migrate toward the group they belong to, people who speak the same language. It wasn’t easy. There were a lot of situations when there was lots of pulling each other apart, lots of arguments. People were fighting for leadership. I had to remain neutral, in order to be able to talk to leaders from East Africa, West Africa or South Africa. We’re in a neutral country now. Let’s try to forget about what happened in Africa. Let’s get on the same table and try to advocate for our people, as one. Community needs are evident and similar, no matter where you’re from. We’re all looking for the same services. If we work together, we can do a lot more than if we work apart. Our goal is to serve an advocacy role to be able to assist African communities. We will work as a team to provide for folks who are here as refugees and immigrants. Africa House will also help promote cultural literacy and preservation. It’s difficult for us to accomplish anything if we’re doing our own little activities. Having all of us under one roof makes it possible for us to work together as one united organization. "We were seeing more Africans from different nations coming to this country. It was necessary to have an African community center, where we can help African refugees and immigrants access services." "I learned that it’s really important to advocate for your own community. My experience as a student was different from the way many Africans were coming into the country." "When we first came, we didn’t understand the culture. Now, we know how the system works. I personally felt that I should take a leadership role to help those people that are coming after us." "Look at the history of refugees during World War II, when white Europeans started coming to this country. Americans of European descent assisted them to settle. Asians and Africans didn’t have that kind of help, because there were so few of us." "Our goal at Africa House is to serve an advocacy role to be able to assist African communities. We will work as a team to provide for folks who are here as refugees and immigrants."